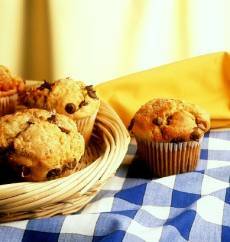 Enjoy these scrumptious muffins in the morning with coffee or tea. A wonderful winter "warm up" treat. Preheat oven to 375 degrees F (190 C). Grease a 6-cup jumbo muffin pan. In a large bowl, beat butter and sugar at medium speed of electric mixer until light and fluffy. Beat in egg, vanilla, dissolved coffee granules and coffee liqueur until blended. In medium bowl, combine flour, baking powder and salt. Add flour mixture to butter mixture alternately with milk, beating just until combined. Fold in chocolate chips. Divide batter among prepared muffin pan cups. Bake in preheated oven for 25 to 30 minutes or until centers spring back when lightly pressed. Serve warm or at room temperature. Very good. My husband likes it a lot. Thank you!! I choose it as very good as it gives me more inspiration in making these muffins for my project. However, you can also try to show how the methods are done by using a vidoe clip. These are very tasty muffins! The wet:dry ingredient proportions seem a bit off. The batter was so stiff that I doubled the amount of milk that was called for. I tried some with chocolate chips and some without. It tasted very plain without the chocolate chips, guess more instant coffee is needed. My grandchildren love these better than any of the bought ones. Still not sure about flour (I live in South Africa) but add extra milk as the batter is very stiff. I think these are excellent, very tasty, right texture, a real treat. Like others, I added a bit of milk (2TBS); I made 10 in a 1/2cup capacity muffin tin, cooked at 200C° for 10 minutes and then lowered to 190° for about 5. Thanks Diana, excellent recipe. These muffins are fantastic! I've made them a number of times now and they always turn out fantastic. A favourite with numerous members of my family too! Mmm, like coffee in a muffin. MY FAVORITE!!!!!! Although the texture of the muffin was exhilarating, I found the taste a bit bland, although the coffee was a scrumptious and flavorful experience.